The Squawbush, or Basket bush, more commonly, has received its name for the use of its sapling branches for basket making by native American tribe in the Southern California to Northern Mountain area of the state. The bush is similar to poison oak, but has dull, rather than reflective, leaves. 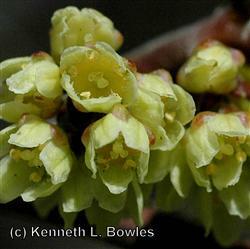 The pale yellow flowers develop into reddish-orange berries that are sticky to the touch.